LAS VEGAS, NV--(Marketwire - May 19, 2008) - CityCenter has revealed that its stunning resort casino, scheduled to open in late 2009, will be named ARIA. With an unprecedented combination of striking architecture, sustainable design, high-end service and spectacular amenities, ARIA Resort & Casino will immediately become the focal point not only of the Las Vegas skyline but of the hospitality industry. "ARIA will be demonstrably different than any resort that has preceded it," said Bill McBeath, the resort's president and COO. "Even in a city such as Las Vegas, with its extraordinary history of dynamic cutting-edge development, ARIA will introduce a new generation of resort experiences." Designed by the world-renowned firm Pelli Clarke Pelli, ARIA's architectural expression will reveal itself at every turn, from its two breathtaking curvilinear glass towers to the clean use of natural elements including lush foliage, wood and stone. Soaring open spaces, ranging from ARIA's three-story lobby and casino to its guest rooms, will fill with natural light and evoke breadth and freedom. Art and interior design will envelop guests in warm, comforting surroundings and provide a sense of human scale. Impeccable hospitality and creative personalized attention will join with an incredible array of amenities to provide each guest an unmatched journey through ARIA. The resort casino will feature a variety of dining experiences, from the casual comfort of bistros and cafes to culinary masterpieces from world-renowned chefs and restaurateurs. Guests also will enjoy ARIA's dynamic collection of lounges, bars and nightclubs. For a day of relaxation, ARIA's luxurious spa will offer a complete menu of skincare, massage and hydrotherapy treatments to be enjoyed in its 62 individual treatment rooms or three spa suites, designed to accommodate couples' treatments, bachelorette parties or small group events. Guests also may savor a quiet moment on the spa's co-ed balcony overlooking the resort's beautiful pool. The spa will be complemented by the resort's full-service salon, barbershop, deluxe fitness room and group exercise studio. 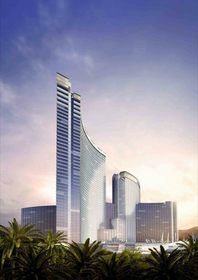 ARIA will form the core of CityCenter, a more than $8 billion dazzling vertical city underway between Bellagio and Monte Carlo resorts on the Las Vegas Strip. CityCenter also will feature three luxurious non-gaming hotels, Las Vegas' first Mandarin Oriental, The Harmon Hotel, Spa & Residences and Vdara Condo Hotel; Veer Towers, the development's only strictly residential buildings; and The Crystals, a 500,000-square-foot retail and entertainment district. CityCenter is a joint venture between MGM MIRAGE (NYSE: MGM) and Dubai World. The contemporary architecture of the ARIA tower will be complemented by the resort's lavish accommodations. ARIA's 4,004 guest rooms, including 568 suites, will incorporate integrated technologies never before used in the hospitality industry. Guest room corridors streaming with natural light will open to areas of enclosed glass, delivering spectacular city or mountain views. Guests also can enjoy these breathtaking panoramas from the privacy of their rooms; all will feature expansive floor-to-ceiling windows. ARIA's modern tower is uniquely designed to deliver corner-window views from every guest room. ARIA's rooms and suites will imbue a melodic composition of dramatic color tones, expressive artwork and a lyrical balance of textures and materials that convey calm and elegance. Each room will be complemented by dark woods, impeccable décor and sumptuous amenities. As the entertainment centerpiece of ARIA, the visionary team at Cirque du Soleil has partnered with CKX, Inc. and its subsidiary Elvis Presley Enterprises to create a permanent production celebrating the timeless musical legacy of Elvis Presley. The show will bring Elvis back to Las Vegas for millions of his existing fans and create a buzz that will enable the persona of Elvis to attract untold numbers of new followers. The creative combination of live musicians and singers, projections, dance and the latest in multimedia sound and lighting technology will aim to create an emotional bond with the audience. ARIA will provide a premium meeting experience with a unique blend of modern architecture, distinctive décor, and 300,000 square feet of technologically advanced meeting and convention space. Four ballrooms will offer the flexibility to accommodate gatherings of all sizes from 10 to 5,000 attendees, and three will feature fully functioning theatrical stages. The facility will encompass three levels and deliver a total of 38 meeting rooms ranging from 800 to 2,000 square feet. The north façade will feature a spectacular glass curtain wall that overlooks ARIA's beautiful pool providing a lush, landscaped backdrop and the warmth of natural light. Throughout CityCenter's grounds, visitors will enjoy access to an extensive $40 million public Fine Art Program encompassing a multitude of styles and media -- ranging from sculptures and paintings to large-scale installations -- engaging visitors on both a visual and intellectual level. The CityCenter Fine Art Program is designed to become a benchmark for enlightened corporate involvement with the arts on a global level and will be one of the world's largest and most ambitious corporate art programs. One of the program's highlights will be featured within ARIA's reception area. Famed artist Maya Lin is creating an approximately 133-foot silver cast of the Colorado River, which will be her first work of art displayed in Las Vegas. Lin is incorporating reclaimed silver in the spirit of CityCenter's commitment to sustainability and in light of Nevada's standing as the "Silver State." The work of Jenny Holzer will be on display as guests approach the resort's north valet, where they will be welcomed by one of the artist's insightful LED signs spanning more than 250 feet. Additional artists represented in the Fine Art Program will include Nancy Rubins, Claes Oldenburg and Coosje van Bruggen, Frank Stella, Henry Moore and Richard Long, among others. Just outside ARIA's lobby doors, The Crystals, CityCenter's retail and entertainment district, will house more than 500,000 square feet of sophisticated retail and deliver exclusive offerings from the world's most celebrated brands. Currently, CityCenter is the largest privately financed development in the history of North America. Charting a new course for responsible growth in Las Vegas, CityCenter is pursuing the U.S. Green Building Council's Leadership in Energy and Environmental Design (LEED) certification. As planned, the 18-million-square foot, multi-use project will become one of the world's largest environmentally sustainable urban communities. The resort casino's design incorporates sustainable features including the extensive use of natural light, dramatically reducing lighting power requirements in guest rooms and water-saving fixtures throughout. For more information about CityCenter, visit www.citycenter.com.